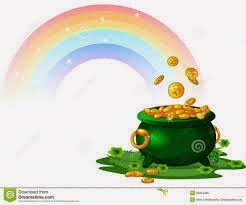 A Highly Motivational and inspirational story for Students :"Pot of gold"
These days, I spent most of my spare time in writing motivational stories. Recently, I was at a social gathering where somebody asked me to tell a motivational story which can be used to motivate students. Once, there was a guy name Sam lived in a village. He used to take pleasure in disturbing others and liked to wonder aimlessly. He was the most aimless and easygoing person on the earth at that time. Failing thrice in 10th standard forced, his father to look for other options. Whenever, his father tried to send him for working in the field. He would make excuse to come back home, his parents were fed up, of his lying habits. One day, he came back home and told his mother that “Mother, today I heard a voice which told me that i was King Akbar of ancient times. His mother got furious; she knew how big a liar and dishonest he was. And being the only son of the biggest landlord had worsened the situation. But this time she decided to teach him a lesson. He said “Yes mom, and you know, the voice declared, I will get hidden GOLD somewhere after few months". "Yes mother, and even I don`t like working. I just want to eat my favorite food, play with friends, travel the world, and do nothing"
His mother said “God bless you my son, I will pray that you find your gold and enjoy life” She shown no emotions and went to finish her pending work. He became little skeptical with her behavior. This was the first time when she responded so sweetly to his lie. 'Let`s see what will happen?” he muttered. From that day, his mother`s behavior changed. Now she used to take good care of him, she left yelling and scolding him for not doing anything. He was very happy, as this is what he always wanted. Few days passed and he forgot about that incident. One day, his mother came running to him. "Sam ... Sam....I have something to tell you." He saw, his mother carrying something like a pot in her hand. "What`s this in your hand mom?" he curiously asked. "I suppose, this is the GOLD pot about which, you told that day"
She excitedly handed over the GOLD pot to him. “But where did you find it?" his eyes shined with Greed. She ate rest of the words. "But....but what mom?” he asked impatiently. "There is nobody to work in paddy field so your father has decided to sell the fields." she looked into his eyes. "But who will dig it?" she asked. He remained silent, she continued “You know, we can`t trust on outsiders because if once this news spreads. The govt. will take over and we won`t get anything"
Next day, he woke up early in the morning and went to the field. He worked for the whole day and found some gold coins but not the gold pot. From then on; it became his habit to go in fields early morning and search for gold. He went on digging one filed to another. He kept on working for months. Today, He dug up the last field; the attempts seemed unsuccessful, so before starting again, he decided to take rest for few days. After one month, when he went back to the fields, he was amazed to see that all his land was covered with little green plants all over. He questioned his father about this. His father told him that “I used to plant the seed in nights, after you finishing the work. HE smiled and praised his father and mother efforts in making him a hardworking man and when after few more months, his fields came in full strength. He was delighted to see the fruitful result of his efforts. Om Prakash Yadav, a Class VII student and the son of a UttarPradesh farmer. My name is Rohit Saxena and I'm from Rajasthan. Which quality is most important for success in life?